Poet Biofuels: Charting the Future of Ethanol? Turning off the tap is not enough! New innovations in the solar power industry are making solar more affordable than ever. Now nearly anyone can afford a small startup kit that will allow homeowners and business owners to start producing renewable energy and add more panels as their budget allows in the future. Just a couple years ago the minimum solar power kit you could find was about $8000. This was primarily because of the inverter, which changes the DC power from the panels to AC power for your home. The smallest grid-tie inverter that you could buy was about 1500W, and cost about $2000. 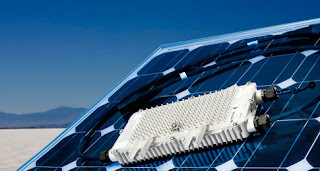 Because of this, it only made sense to maximize the capacity of the inverter with the most solar panels. This would add to the cost of the system bringing it into the $8000-$10000 range. Now, technology has advanced to the point where we can use a new device called a micro-inverter. About the size of an internet modem, these inverters cost about $200 each. They are designed to be connected to one panel with a wattage of 200 or higher. The inverter is then simply connected to the grid at your home or business. This means that you can just buy one inverter and one panel, with racking, wiring, and disconnects, for less than $1500 and start generating grid-tied renewable energy. This changes everything. Now almost anyone can afford a starter solar power system. Maybe the best part of this new development is that there is virtually no limit to how large or small your system could be. Many people are starting with a one panel system, and simply adding a panel every year as their budget allows. In 9-10 years they would have a system that could provide the majority of their power needs. Since the system is one inverter for one panel, you just add a system, or multiple systems, into your electrical feed and watch the power bill go down. These systems are eligible for the same tax incentives and rebates that the larger systems are. As long as your local utility doesn't have a minimum system size, which most don't, you'll get your rebate with just as you wold with a large system. The new micro inverter systems also come with a digital readout capability that connects to the internet. This means you could see what each panel/inverter combination is producing at any given time, whether you have 1 or 100 panels. And you can track your production over time as well to see when you getting the most out of your solar system. Another added benefit of these kits is that can actually produce more than a traditional kit of the same wattage. This is because each panel/inverter combination is only limited by the amount of sun it receives. In the traditional systems, the panels were arranged into strings. If one panel in the string was shaded or malfunctioning, the entire string would be affected. With the new inverters, if one panel is shaded, it only affects that panel. So these new systems truly are revolutionary. The time has never been better than now to get stared producing your own solar power. Kriss Bergethon lives off grid with his wife in Colorado, for more information visit his site at Solar Panel Kits.